Biosurfactants are amphiphilic compounds produced by microbes, either on the cell surface or secreted extracellularly and are a natural biological solution that can address the biological presence of pathogens and biofilm. Biosurfactants have been used for decades in water and soil remediation programs, as well as the petrochemical, pharmaceutical, biomedical and food processing industries. The process starts with the introduction of the appropriate bacteria, (such as probiotics), that produce the desired biosurfactants to address specific issues in targeted environments. So use of biosurfactants in commercial cleaning is a logical adaptation of their proven capabilities from these other sectors, and represents a major technological breakthrough. Biosurfactants have been shown to exhibit strong antimicrobial, anti-adhesive and anti-biofilm properties, making them a useful component in cleaners to combat pathogen bacteria, in part by making the surface environment hostile for pathogens. Z BioScience’s Probiotic Cleaners incorporate a larger number of probiotic bacteria in its patent pending proprietary blends than those used in the above noted test at the Walter Reed Army Institute of Research; (and are designed to deliver a larger range of biosurfactants into the cleaning process). Z BioScience’s combined chemical and probiotic system creates and sustains an environment that is hostile to pathogens. 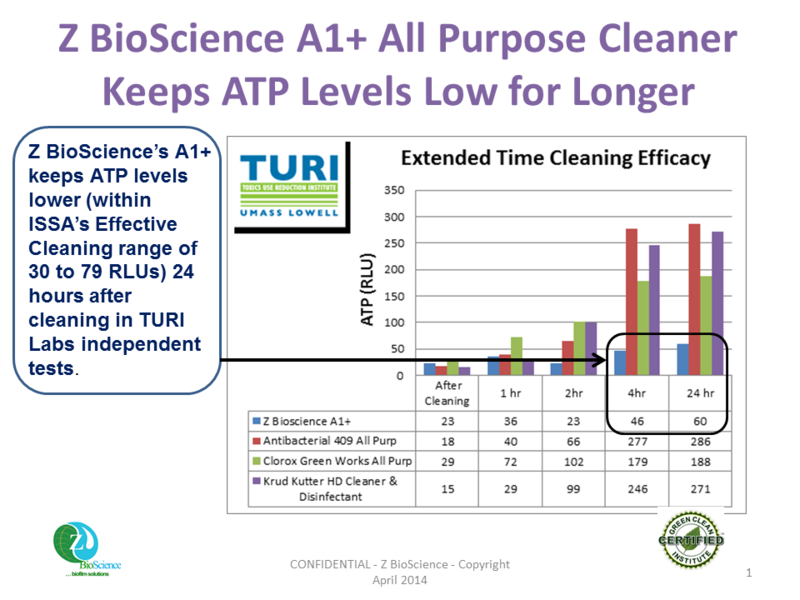 Independent tests demonstrate that Z BioScience’s Probiotic Cleaners deliver better and longer lasting levels of clean as measured using ATP (Adenosine Triphosphate) as an objective, scientific measure of clean. ATP levels of surfaces cleaned with conventional protocols of Chemistry and Physics are returning to near pre-cleaning levels within four hours after cleaning, registering ATP levels that indicate an unacceptable probability of a pathogen biofilm presence as shown in the table below. Conventional cleaning methods constitute a combination of Chemistry (quats, bleaches, oxidizers, enzymes) and Physics (sweeping, vacuuming, scrubbing, wiping). These combinations consistently fail to address the presence of biological contaminants such as pathogens and the biofilms they form, as evidenced by the rise in Hospital Acquired Infections (HAI) from multi-drug resistant staph (“MDRs”) such as MRSA. The spread of such MDRs from healthcare facilities into schools, sports facilities, public transport, and even the home is further evidence of the declining efficacy of conventional “chemistry-only” based offerings, and so the need for a “Next Generation” approach to cleaning . Z BioScience’s introduction of biosurfactants produced by its probiotic constituents into the cleaning process represents a “Next Generation Cleaning System”. Conventional “chemistry-only” products adopt a “kill everything” approach; indiscriminately destroying the much needed “good” bacteria along with the unwanted “bad” pathogen bacteria. Z BioScience’s Probiotic Biosurfactant Cleaners over populate surfaces with safe, healthy probiotic bacteria. In this process these probiotic bacteria produce biosurfactants that work in conjunction with the chemistry they are applied with to provide cleaning at the microscopic level for a truly clean surface. In this way the ongoing presence of the probiotics on surfaces provides a unique and lasting level of protection by making the surface a hostile environment for harmful pathogens. Another benefit is the elimination of odors. All the probiotic bacteria in Z BioScience’s Probiotic Biosurfactant Cleaners are Class 1, and classified as GRAS (Generally Regarded As Safe). Many are used in food processing and food packaging applications and may be used as a dietary supplement. The products are all pH Neutral, and are designed for use around people with most chemical sensitivities, children and pets. https://en.wikipedia.org/wiki/Amphiphile Amphiphile (from the Greek αμφις, amphis: both and φιλíα, philia: love, friendship) is a term describing a chemical compound possessing both hydrophilic (water-loving, polar) and lipophilic (fat-loving) properties. Such a compound is called amphiphilic or amphipathic.